The above info came from ...sure, and was edited by yours truly (contact me). The image came from Nautiljon.com. Tenma Tsukamoto is a high school student who is in love with Ooji Karasuma. She tries to confess her love to him many times, but failure always awaits her. On the way, her friends help her. However, there is a love SQUARE going on. Someone loves her! A delinquent named Harima Kenji, who changed because of her. 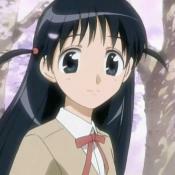 Tenma likes Karasuma, Harima likes Tenma, and Tenma's younger sister, Yakumo, likes Harima! The above description came from ...sure, and was edited by yours truly (contact me).